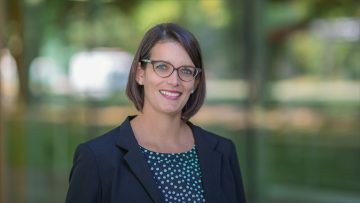 We recently interviewed Ashley Welsh, Faculty Liaison, for the Faculty of Science on her role as a liaison, engagement with first-year students through Jump Start UBC, and ways of integrating Indigenous content and perspectives into practice. As the Faculty Liaison, Ashley advises and supports faculty and graduate students with the development and evaluation of teaching and learning enhancement projects. She also contributes to curriculum and course development, professional development services, and the development of the Faculty-wide undergraduate student learning outcomes. Ashley is cross appointed between the Science Centre for Learning and Teaching (Skylight) and the Centre for Teaching, Learning and Technology (CTLT) as a means to improve collaboration among these groups and to enrich the scholarship of teaching and learning occurring within the Faculty of Science. Can you share with us about your role and work at CTLT? As the Faculty Liaison (Science), I am jointly appointed between CTLT and Skylight, the Science Centre for Learning and Teaching, in the Faculty of Science (FoS) Dean’s Office. The embedded nature of this position allows me to build, support, share, and sustain teaching and learning projects and partnerships within the FoS and more generally across UBC. Within this role, one of my main responsibilities is to enrich communication and collaborations among Faculties and Units at UBC in order to build a more cohesive and inclusive environment for teaching and learning. As such, I get to network with a lot of interesting and inspiring people. What are some exciting projects you are currently working on? While I am involved with several teaching and learning initiatives at UBC, I have a particular interest in projects related to enriching student experience, well-being, and inclusion. One of the main projects I am currently working on is the development of BSc Degree Outcomes for the Faculty of Science. As such, I am consulting with students, staff, faculty, and administration to develop a framework and resources that outline the knowledge, skills, and competencies that BSc students could achieve at the end of their degree. What I like most about this project is that we’re not just focusing on the academic skills and knowledge, but what skills and experiences make a well-rounded, respectful, and inclusive person. It’s easy to become fixated on knowledge or grades and as such, it’s important to highlight and support how students (and we) develop as individuals across our schooling and careers. Networking and collaborating with colleagues at the FoS Student Engagement Office, the Centre for Student Involvement and Careers, the Student Diversity and Wellbeing Initiatives, and Indigenous Initiatives have helped me to build a more holistic, interdisciplinary understanding of how best to support faculty, staff, and students in the Faculty of Science. Can you share about your engagement with Jump Start UBC and engaging with first-year students? I first became engaged with Jump Start, a multi-day orientation for first year students, in 2015 as a Science Faculty Fellow. As a scholar in undergraduate student learning and experience – and having been a student myself – I am sensitive to and aware of the importance for students to develop a sense of belonging early in their university experience. Such orientation programs are critical for helping students to build community and to learn more about the academic, social, and personal challenges and benefits of university. It was a great experience for me to build fruitful relationships with incoming first year students and other colleagues at UBC. In addition to being a Science Faculty Fellow, for the past three years I have facilitated a large group session called “Thinking in the Sciences” in which students question “What is Science?” and “What is the role of Science in Society?” This lecture provides a large classroom experience and challenges students to question their perceptions and experiences both personally and academically. How did you become interested in engaging with Indigenous content and perspectives? While I have been attending UBC workshops and sessions related to Indigenous content and perspectives for 5+ years, my main collaboration and connection with CTLT Indigenous Initiatives emerged as a result of my facilitation of the Jump Start “Thinking in the Sciences” lecture. For years I had been telling myself that I would engage more holistically with Indigenous perspectives and knowledge in my course content, but this desire often remained on the back burner. In 2017, I made the commitment to work with Amy Perreault and Janey Lew to revise my “Thinking in the Sciences” lecture to include Indigenous perspectives and to create space for me to acknowledge my own positionality as a settler within Canada. Working closely with Indigenous Initiatives was extremely helpful for me to question my own experiences and biases, and to select and embed Indigenous content in a respectful manner. There is often a discomfort or fear that comes with the inclusion of Indigeneity and that one can mess things up or further instill stereotypes. The openness and willingness of Amy and Janey to guide me through this process was extremely valuable and without it, it’s likely my desire would return once again to the back burner. There was an article you shared amongst your colleagues at CTLT called, “Faculty Developers as Allies (Not Experts) in Supporting Indigenous Perspectives.” What about this article resonated with you? Two main aspects resonated with me: 1. We are allies, not experts; and 2. Faculty developers as main points of contact. With respect to the first, the author (Kathleen Bortolin) is upfront that as allies (non-indigenous peoples) we want to support Indigenization, but that we are not the experts. As mentioned by Bortolin, we have a lot to learn and need to listen – “really listen” – to the stories and experiences of Indigenous scholars, elders, and community members. While I still have a long way to go, I am grateful for others’ willingness to support my learning and unlearning. Further reading on “Faculty Developers as Allies (Not Experts) in Supporting Indigenous Perspectives”.